Photo: View from the Alderson Historic District, Alderson, WV. The Historic District was listed on the National Register of Historic Places in 1993. Photographed by User:CZmarlin (own work), 2009, [cc-by-3.0 (creativecommons.org/licenses/by/3.0)], via Wikimedia Commons, accessed July, 2015. The Monroe County Courthouse is located at 216 Main Street, Union, WV 24983; phone: 304-772-3096. Monroe County was created in 1799 from part of Greenbrier County. Artifacts indicate that prehistoric tribes of Native Americans may have lived in the area which would later become Monroe County. Upon the arrival of the first Europeans, however, there were no permanent native settlements. Various tribes were leading periodic hunting expeditions into the region, when the scattered cabins of white settlers began cropping up around 1760. Agriculture and timbering soon became the mainstays of these early European settlers. 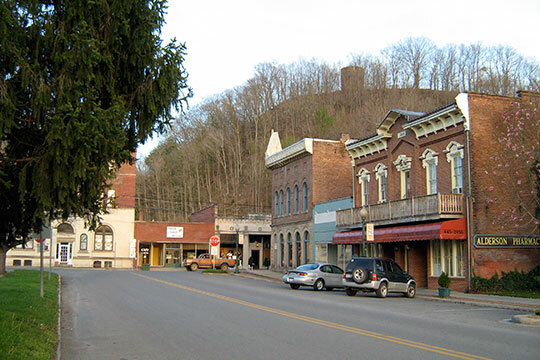 Towns began to appear in the late 1700s, and became centers of administrative, judicial, and commercial activities. Individual landowners controlled the very modest growth for over 200 years. Communities were well defined, and rural areas were maintained as places to conduct farming and timbering. Mineral extraction has never played an important role in the county, and coal is not known to exist within Monroe's borders in quantity or quality sufficient for mining. Monroe County Planning Commission, Monroe County West Virginia Comprehensive Plan, 2009, www.monroecountywv.net, accessed July, 2015.